Happy Thursday morning!! 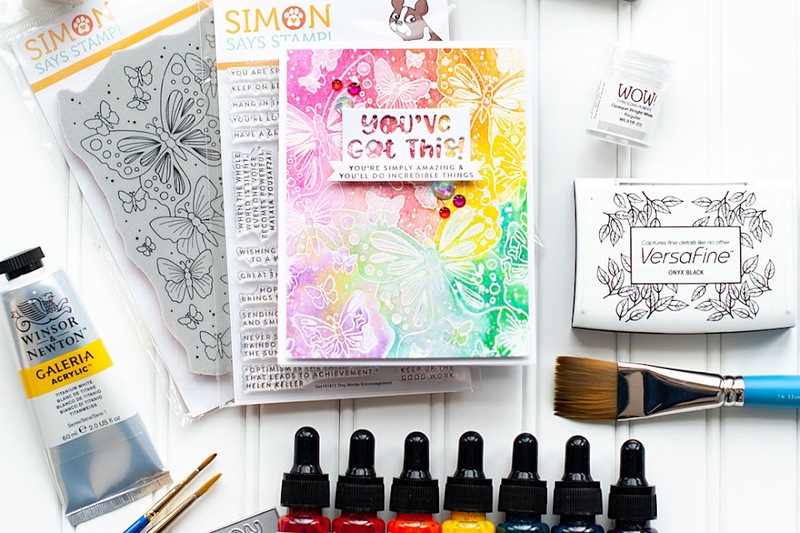 Today we are doing a super fun blog hop at Stamper's Dream, and there are two fabulous prize packages that you can win! So, keep reading to find out how you can win! Instructions: Fold kraft cardstock in half to make card base, and round the bottom corners. Cut blue damask paper a 1/2" smaller than the card, and round the bottom corners. Cut a scalloped edge from cream cardstock, adhere to the bottom of a pink dot paper strip, and then adhere to the blue damask block. Tie ribbon around pink dot strip, and then adhere the entire block to the card front. Cut a circle from cream cardstock, and stamp the sentiment to the top of it. Stamp the cupcake to vellum and then cut out. Stamp it again to pink dotted paper, cut out, cover in glitter and then adhere to the vellum piece. Add twine trim to the bottom of the vellum cupcake and accent the middle with a pearl. 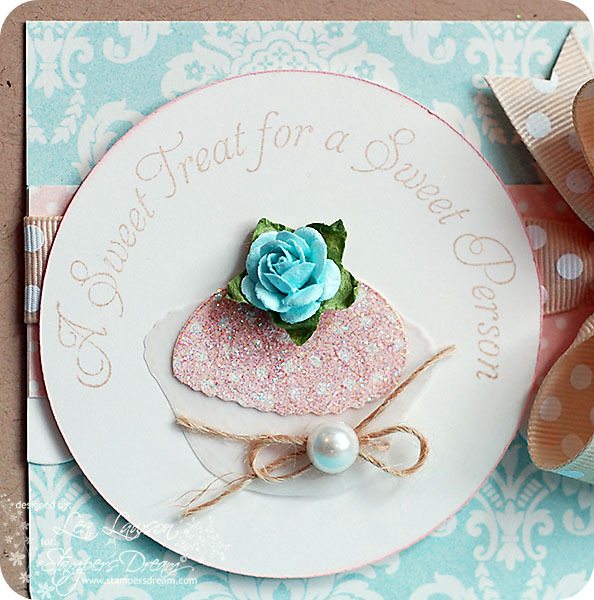 Adhere the entire cupcake to the cardstock circle, and accent with a blue paper flower. Adhere the entire circle piece to the front of the card, and then add three jewels in the lower right corner of the card to finish. Here is a close-up shot of that sweet little cupcake.....it is so yummy! And as a non-coloring stamper...paper piecing is a great way to add texture and color in a different way! your card is beautiful Lea, and so elegant too! Love the papers! Love it. Great job! :) I like the intricate sentiment. Love the rose. It looks edible! That is such a "sweet" card. I can just eat it! You ladies have so much talent! How sweet is this! I love it! Your cupcake is so yummy . . . .love the glitter and adorable blue rose . . . so sweet! Lovely cupcake card. Love the soft colors of the paper and ribbon. Ah, such a sweet card. Love the twine bow on the cupcake. Cute card, love the glitter and the rose. Thanks for sharing. Love the cupcake!! So cute. What a sweet card and cute and sweet sentiment to go along with. I always love kraft paper! What a lovely thing you've done on top of it! cute card. i like that it is round. i don't see enough different shaped cards. cute elements, too. Lots of pretty detailing here....very girly...thank you! Yummy!!! That little flower looks like real frosting!! Great soft colors! Wow this card is delicious! Thank you for sharing it with us! I love the cupcake and flower.....such detail...beautiful! Gorgeous card ! Thank you for sharing. All I can say is, Cute, Cute, Cute!!! What a stunning cupcake! Love the simple little cupcake with blue pink background! Thanks for sharing and love the giveaway stuff...!! This is beautiful! And look at that perfect bow too!! What delicate detail. Simple and sweet. Well I think you card is a sweet treat! Lovely, Lea...so elegant and delicate. Fabulous job with those stamps! Very sweet card. So soft and elegant. What a sweet card. Love all the details. Totally sweet! Love the sparkly top of the cupcake, and the little rose is a perfect topping! TFS! What a cute card. I love the sentiment. Who wouldn't love that cupcake? Thanks for sharing. I simply cannot get over how perfectly you tied the bows. But that is not the only thing I love about this card. It is beautiful. Gorgeous Lea! Love the soft colors, the polka dot ribbon (and that perfectly tied bow!) Just beautiful. Love your card and all the bling! The colors go together beautifully! Thanks for sharing! Wow! What a sweet treat! Love your card! Don't you just love the way your card turned out? I certainly do. I'm so glad I stopped by on this hop. That cupcake shines. Lovely card. Looks good enough to eat! Love the rounded sentiment. Leah - loving this colour combo, simply beautiful! Love the colors that you used. This journey is about to close for me and it has been a fun ride :)Thanks for the great morning. How cute is this. Love the cupcake. love that you used Kraft cardstock, it's just gorgeous. I love it! This is so pretty! Love the papers and the cupcake. Such a "sweet" card! Thank you for sharing! How absolutely delicious! Beautiful card and love how you put the flower on top of the cupcake. Adorable card. Love the bling on the cupcake, too! Cute and pretty at the same time!! Love it. Really cute card - cupcake with sprinkles...yummm. Keep up the great inspiration! What a sweet card! Now I'm craving a cupcake! love the card and the bit of sparkle. love the addition of the polka dot ribbon. You did a great job with the pinks on this card, they are what makes it so cute! Luv your gorgeous cards Lea. Luv to win the blog candy. A very pretty card. Thanks for sharing! Great card. Love all the texture. Very "sweet"! Gorgeous and Girly! Love it! I love the color combination- Thanks for sharing such a sweet card! Great card Lea! Love your work. 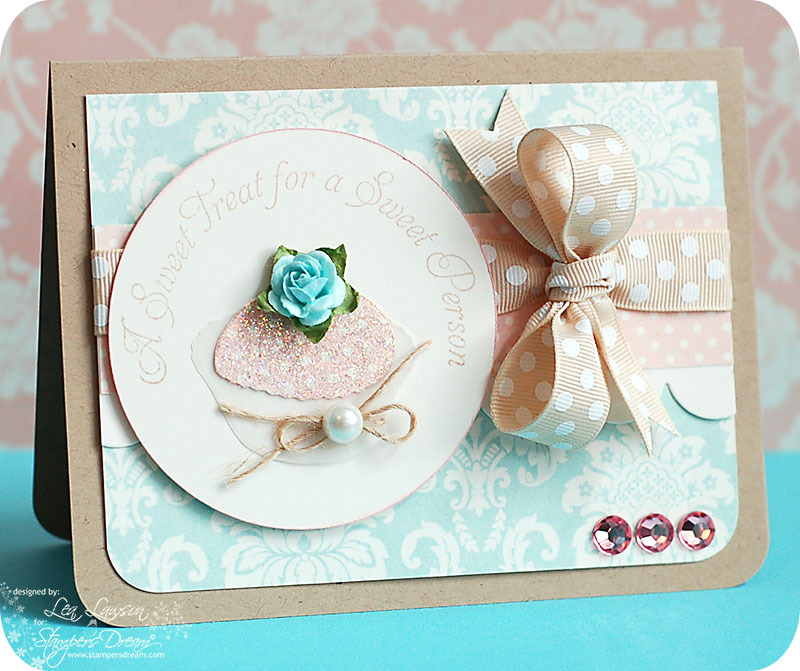 Such a charming card using soft colors. Awesome card. Love the added glitter. What a great birthday card...I love the color combo. Beautiful. Hugs, Tersa E.
So beautiful combination of papers and embellishments! So adorable! Love that cupcake...gotta go, I'm hungry! Love your sweet card. I like how soft the colors are which is really appealing to me. Thanks for the inspiration! Have a great week-end! Let's hope my name is on one of those fab prizes! its beautiful, love the cupcake and the bow! Love your card! Love you blog! Wish I had time for the TE hop, but MAN that is a lot of names! WHEW! You are terific with your cards, what a fun hop this is! Beautiful card Lea! I love the colors and that ribbon is fabulous! So beautiful and thank you for the tutorial. Some of us need all the help we can get! Love the card, and the sentiment. Very pretty card. Love the soft colors. What a pretty card!Love it! Beautifully done. I love your design, the colors, the glitter and all of the other embellishments. Whoa! These are both gorgeous! What a great eye you have for detail. And you've been busy!! Your card is really pretty. I love the colors and the rose for a cupcake topper. Your cards are very imaginative. Very cheery! How sweet! I love it! Your cupcake looks good enough to eat. I love the glitter and adorable blue rose! Great card for a special friend! This is adorable! Thank you for including the tutorial! Such a cute card. Like the blog candy. what a wonderful card ! the little flower is so nice too! Lea, That is a very cute card. I love the colors. Good job! So pretty, Lea...love that glitter and bling! Sweet, sweet card. Great colors. How sweet - pink is my favorite color for cards!! very pretty card with all the pretty glitter! A vision of pastel loveliness! Love the glittered cupcake and the circular sentiment! The twine is a nice touch, a contrast to all the sweet elegance! This is so sweet and soft-love the look! Love this card Lea! Especially the pearl wrapped around the cupcake! Gorgeous! What a beutiful card - the soft colors make it appear so delicate. A welcome breath of fresh air for Spring to arrive! Thanks for sharing your creative talents. This is fabulous. My Mind's Eye paper is one of my favorites. Beautiful card. Thank you for giving us a chance to win amazing blog candy! love the soft pastels in this card plus the touch of glitter. the perfect bday card for a young girl. michelle f.
Yummy cupcske and lovely bow. Sure to put a smile on someone's face. WOW!!! This is soooo pretty and elegant...love the sparkle on the cupcake and what a gorgeous bow!!! Yum! I love the soft n sweet colours! I sure hope I win that #1 prize pack cuz I'd love to try the epoxy sticker maker!! Definitely a yummy card! Love the soft colors and the ribbon is wonderful. 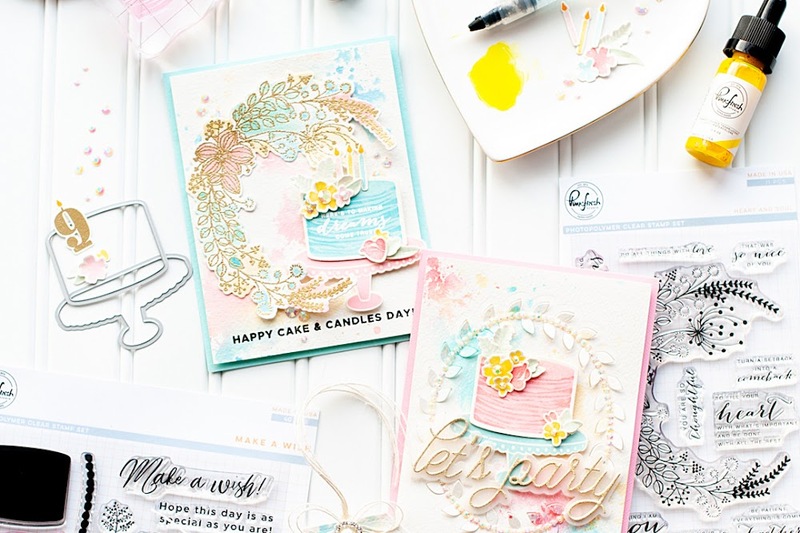 Love the dimension and style of your card! Just beautiful! Adorable card with such a yummy cupcake! Great card. Love the colors and the style. Ooooooh, precious! I love the ribbon, and even your rose looks like a frosting decoration. Very cute! I ordered the sentiment. I'm glad to see it in use and looking so good! I agree! It is scrumptious! Very "sweet" - pun intended! I love the blog hopping because I get to see people's work that are all new to me. Thanks for sharing your creative work! What a gorgeous card! I love the glitter! Love your card and how soft and delicious it looks. It did a great job and I won't have to count those calories. This is beautiful! That cupcake is too gorgeous to eat -- I love the pearl and twine accents! Love the colors and all of the textures here! 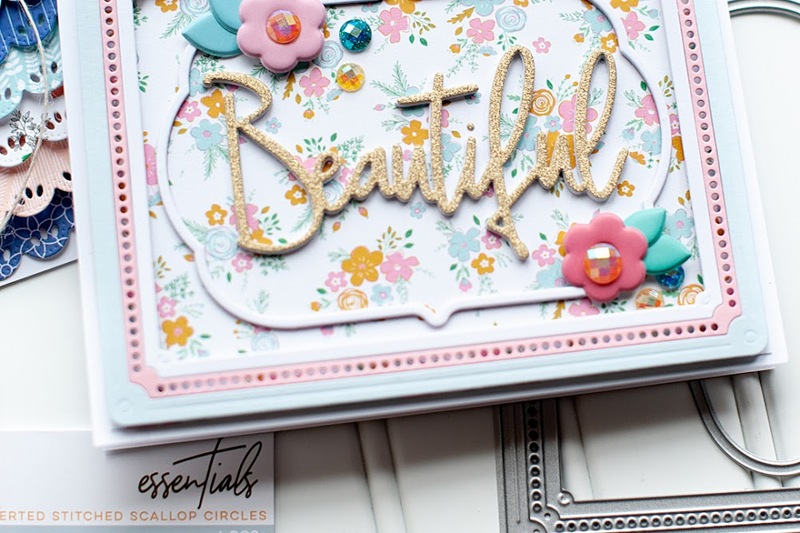 Beautiful lovely card with perfect colors, layering and embellies. nice subtle color combination really make this a standout card. Nice! Yummy card! The colors are great. Thanks for sharing. A really sweet idea for a card. Sweet card, in more ways than one! Looks good enough to eat. A very sweet card--nicely done. I love pearls. You are a very busy and talented woman. Thanks for sharing your talent. I love these colors! Beautifully done! Your card is so cute, I really like the font of the sentiment...darling! How sweet! Thanks for sharing your talent with all of us. You're right, a very sweet card! Love the colors and details. This is so dang cute! I love that bow!! Beautiful card, and thanks for the detailed instructions. I'm new at this, so that's really helpful for me. What a sweet cupcake. Love it. Super Cute! Love the cupcake! LOVE YOUR CARD! JUST BEAUTIFUL! Really a sweet card! Love your glitter and the layout. Love your card. Pretty pastels. You card is precious with it's sweet little cupcake and shimmery frosting. I love the twine and pearl. Great design. Adorable card, love the colors! you are very talented. Thank you for sharing your creativity. Lovely card, and love the soft colors. Lea, I know this is strange but I am so NOT a cupcake girl. BUT you have changed my mind. It is simply beautiful. The card is as well but I am just so swept away to meet a cupcake I like . You did good girl. Sweet indeed! Love this "delicious" card! How elegant and sweet. I love the soft colors! Sensational, Lea! Love how you did the cupcake! What a great card. So love all the parts. Papers, sentiment, bow, etc. Wow! Not only do we get a chance for blog candy.... we also get some GREAT ideas!! Thanks!! What a pretty card! Love the soft papers and that saying - great font!